THE CHILDREN OF THE HALF OF A YELLOW SUN HAS GROWN TO A FULL SUN THAT TROUBLE THE DARK. By Ogbodo U. Ogbodoagwo T.
The 60's brutality of the nation of half of a yellow sun caused the death of about 3.5 million lives, leaving many children fatherless, their women widows and others deformed. The fear of what was done to this nation by the Nigeria military force lead to the disappearance of history from the school curriculum in the country Nigeria. History of how they brutally wiped out about 3.5 million lives and properties of the nation of half of a yellow sun was bound and passed to be a crime if anything is been said or watching of the recordings. The fear or should I say the reason was to hide the gravity of not obliging in the affairs of the law of humanitarian right. The safari of the Nigeria Army that leads to the lost of millions of souls in 60's and up to date has been seen by the entire world and said by the most world media to show the abomination committed against the nation of the rising sun. I speak not of my mind, but of truth, the children of the half of a yellow sun which were rendered fatherless, motherless and homeless in 60's even after been suppressed with the weapon of starvation in the 19 centuries surpassed. Today the survivors of 60's Dark Age has grown to a full sun. 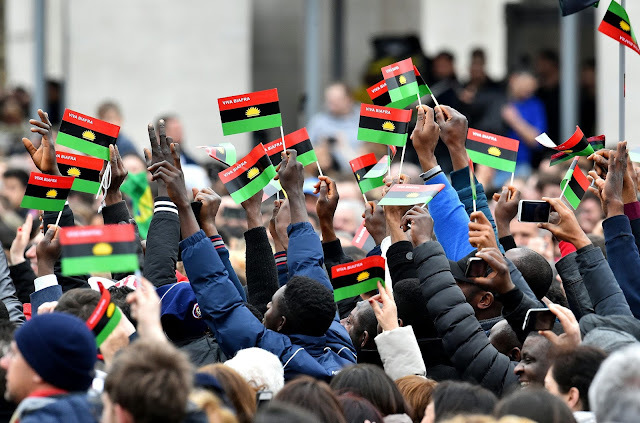 The nation of half of a yellow sun "BIAFRA" is a nation that has been in existence before the creation of Nigeria in 1914 by Fredrick Lord Lugard. The indication can still be found in the map which a times is called "BIAFRA". What started happening after the nation "BIAFRA" lost their sovereignty to the colonial masters lead the great and most famous novelist Chinua Achebe to write in one of his novels "Things Fall Apart" 1958, that was when he started seeing hatred , greedy and killing within the nation, that was once living in fullness and abundance of goodness before the lost of their sovereignty to the colonial masters, thinking it will make them any good, not knowing they have sold their lives to haters, thieves and death. No one was left without been hurt to console another, tears in every home, sorrow became their entertainer, there were mourning in every home, corner of the country, it was horrible. The amalgamation of Biafra, Arewa and Oduduwa to form what is today called Nigeria caused and brought no good unto the people of Biafrans. All that was brought was hatred, killing and denying them of their right to freedom and happiness. The continual killing and hatred over the nation of half of a yellow sun " BIAFRA” made the nation Biafra under amalgamation with Arewa and Oduduwa as one Nigeria chose to be separated and to be on their own just the way they used to be before, the creation of the contraption called Nigeria, which can likely be seen as divorce after marriage, that was the cause of the Biafra war in the history. There was a Biafra before 1967 which lost it's sovereignty to colonial powers. Early modern maps of Africa from the 15th-19th centuries, drawn by European Cartographers from accounts written by explorers and travellers reveal that the original word used by the European travellers was not Biafra, Biafar and sometimes also Biafares. Now, let me correct one impression how some take or talk about Biafra, for your ear understanding. Biafra was a nation before the contraption called Nigeria which its people still exists to a full sun today CE 2016. The amalgamation of Biafra was terminated when the colonial power terminates to whom we lost our sovereignty to. No Writer is better placed than Chinua Achebe to tell the story of the Nigeria Biafra war, he wrote a book "Things Fall Apart" 1958 when he began to see how the people of his country are ill treated. After the amalgamation, in 2012 reminding the children of the half of a yellow sun that have grown to a full sun. He wrote another "There was a Country". To all this, the history has called the children of Biafra have emerged to regain and restore their sovereign identity and state "BIAFRA".